The future Broadway and Hollywood star was born Rauff de Ryther Daun Acklom on April 30, 1900, at Harrow House in Halifax, Nova Scotia, to George Morebye and Lilian Manners Acklom. Distantly related to Princess Diana on his mother's side, Rauff had a noble lineage. His father ran the prestigious Tower Road boys' school Harrow House and later was a literary advisor for E.P. Dutton Publishing Co. in New York. David had an older sister, Dorothea Cecily, born in 1898, who was called "Cecily." The Ackloms moved to New York City in 1907 and settled in Hastings-on-Hudson, New York in 1922. It was at Trinity School where David, age sixteen, acted in his first play, Shakespeare's "The Tempest." playing Fernando. A photo survives from this production that he later captioned, "terribly made costumes." He remembered another famous Trinity alumnus, Humphrey Bogart, who was a year ahead of him. Graduating in 1917, David soon attended the University of Toronto to study forestry. Here, he furthered his interest in theatre by joining the University's Little Theatre at Hart House. In 1924 he joined Basil Sydney's Touring Co. and later Eva La Gallienne's Civil Repertory Co. where the two forged a life-long friendship. David made another close friend in Helen Hayes with whom he co-starred in "Dancing Mothers" at the Booth Theatre back in New York City. They kept in contact until her death in 1993. After several other jobs including working at a New York art gallery and serving as a cowboy guide out west, David found his way to Hollywood en-route to Hawaii with letters of introduction to a sugar plantation. He had recently been married to a young socialite by the name of Suzanne Bushnell (which lasted only twelve months.) Attending a party, he was spotted by director James Whale who had come from England to make the movie version of the successful British play, "Journey's End." Whale induced David to come to the studio for a screen test. Pleased, he offered him the role of Raleigh, the green officer thrown into the hell of trench warfare. Years later David recalled how every young actor had been hoping to land Raleigh and yet he just walked into it. He remembered a very famous English actor who rang his doorbell one morning and cursed him out "from top to bottom" as David put it for taking the role. The movie Journey's End was a smashing success and launched the film careers of James Whale, Colin Clive, who had also been imported from England to reprise his role of Captain Stanhope, and David Manners. The usually closed door of Hollywood had unexpectedly swung wide open for David and he began a seven-year career in the film capital of the world. This career would cast him opposite such legendary film actresses as Katharine Hepburn, Loretta Young, Barbara Stanwyck and Claudette Colbert. Carole Lombard, Constance Bennett, Gloria Stuart, Ruth Chatterton, Elissa Landi, Adrienne Ames, Zita Johann and Helen Chandler, his favorite, were also his co-stars. David's many directors included Frank Capra, (his favorite) George Cukor, and William Dieterle as well as the two horror masters, James Whale and Tod Browning. In 1933 David designed and built an adobe ranch house on an established ranch in the High Mojave Desert, not far from Victorville, CA. As time passed, David became less interested in movie making (which he never enjoyed) and more interested in his ranch house. By 1936 he had had enough and drove out of the studio gate never to return. He later described this moment as the lifting of a great weight off of his shoulders. As early as 1934 he had been writing his first novel that was eventually published in 1941 by E.P. Dutton. "Convenient Season" recalls his youth in the community of Centrelea, where David's aunt and uncle, the Chadwicks, had a beautiful summer home. "Convenient Season" echoes David's love of nature and depicts the home and community through the eyes of a young man who has returned to Nova Scotia from the United States, hoping for fulfillment. The reviews for "Convenient Season" were favorable and David followed up his success with "Under Running Laughter" published in 1943, again by Dutton. In 1940, David officially changed his name to David Joseph Manners and became a naturalized citizen of the United States. Although Canadian by birth, his former nationality was listed as British due to the fact that the Canadian Citizenship Act had not yet come into being. Prior to January 1, 1947, Canadians were British subjects. The 1940s also saw David's return to acting, first in Maxwell Anderson's "Truckline Café" as Wing Commander Hern. Harold Clurman directed and the cast included Kevin McCarthy, June Walker, Kenneth Tobey, Karl Malden, and Marlon Brando in his second stage role. The play, which was produced by Elia Kazan, opened on Wednesday February 27, 1946, at the Belasco Theatre but suffered a short run. David then appeared in Agatha Cristie's "Hidden Horizons" which was a disaster. After a chaotic live television appearance, David co-starred with Cornelia Otis Skinner in Wilde's "Lady Windermere's Fan" at the Cort Theatre. The play ran successfully and went on tour in 1948. "Lady Windermere's Fan" is generally regarded as the swan song of David's acting career; but late 1951 saw him playing John Worthing in Wilde's "The Importance of Being Earnest" at the Playhouse Theatre in Houston, Texas. In 1936 David purchased a CineKodak 16 MM magazine loaded movie camera for $136.00 and began making his own productions, mainly chronicling life on the ranch, which was known as Rancho Yucca Loma. Mojave Almanac was the first film produced by W.M.W. Productions and starred Frank, Ann, and Bunny Rivers. David was the director, cameraman, and film editor. His last film, Those Who Wait, premiered at the El Rancho Music Hall in early 1945 and was described in the program as "A home-front album in Kodachrome, conceived, directed and photographed by David J. Manners." The cast included Ann Rivers Duval, Patricia Squires, Helena May, Peter Duval Jr., Betty Rivers, Steven Rivers, and Gwen Behr, who owned the major share of Rancho Yucca Loma. Years later while living in Pacific Palisades, CA, all of these films along with the original projector, were stolen from David's garage and never recovered. The CineKodak 16 movie camera was in the house at the time and still survives today. David remembered it as making "marvelously clear color pictures." By 1956, upon Gwen's death, David left his beloved ranch (which had served as a resort for many celebrities during its heyday) for the last time; and purchased a beautiful home at 1224 Chautauqua Blvd., in the Pacific Palisades area of Los Angeles. It was around this time that he renewed a life-long interest in philosophy and metaphysics and befriended Bill and Rachel Samuel. Bill, himself a writer, introduced David to a small circle of people who also sought spiritual enlightenment. This period marked a new beginning in David's life and all other pursuits took a back seat to his spiritual path. David began writing again and in 1971 completed "Look Through, An Evidence of Self Discovery" which was published by a small firm in CA. As well as offering some highlights of David's past, the book outlined his new reality, which he called "Isness." Basically, isness is the light of pure being, and cannot really be described by words, which are, by their very nature, dual. With his new reality, David discovered the inner peace he had desired for so long. He would go on to write two more books in the same vein, "Awakening from the Dream of Me" and "The Soundless Voice," as well as record a series of cassette tapes and circulate a newsletter to his friends who were interested. David lived with long-time friend and fellow writer Bill Mercer and remained in Pacific Palisades until early 1978 when he felt the need for a change. Initially considering Northern California, he was eventually persuaded to stay in the south because of its milder winters. Choosing the beautiful oceanside town of Santa Barbara, he moved into a lovely condominium at 1150 Coast Village Road in nearby Montecito. David's new home was furnished with many beautiful works of art and a grand piano. It also boasted a sprawling garden, much loved by David. Not fond of travel, he did however finally make it to Hawaii in the late 1970's. Bill Mercer died of heart failure in the summer of 1978 and in early 1987 David moved to smaller quarters at 1725 DeLaVina Street in downtown Santa Barbara. Gone were the piano and many other extras, David now concentrating on mainly essentials. Many years before he had lavished his remaining movie memorabilia as well as many personal mementos on a young man from New Orleans, LA, whom he had befriended in 1971. Still busy with visitors and many correspondents, David hardly seemed a man of eighty-seven years. Later in the same year he moved once again, this time to Wood Glen Hall, a home for "active oldsters" located at 3010 Foothill Road in Santa Barbara. Having decided he no longer wanted to be encumbered with household chores, David found much more time to relax, read, and paint, mainly with oil pastel. Having studied with artist Lee Mulligan, he would allow a painting to take its own form, to come into being organically, from a few scribbles. In 1990, cataract surgery restored his vision to 20-20, and for his ninetieth birthday, many of his old friends and co-workers were contacted; their letters and sentiments collected in a birthday album that he was given. Among the contributors were Loretta Young, Mae Clarke, Zita Johann, Vincent Price, Ronald Reagan, then president George Bush, Lew Ayres, Elia Kazan, Karl Malden, Katharine Hepburn, Helen Hayes and David's niece Pat Bergen. In mid 1993 David's health went into a decline and he became noticeably depressed. So obvious was the change in him that I mentioned to my wife, after an afternoon visit, that he seemed ready to move on to the next life. Fortunately, he soon found himself in the loving care of Marge Mason at her senior care home in Montecito. A remarkable woman, Marge nourished David back to health and good humor and, along with her wonderful assistant, Geri Guillen, was largely responsible for keeping him alive at this time. For quite a while, David had been in quite a bit of pain and, though he still could walk, preferred to wheel around in his wheelchair. It was fortunate that David was able to get out of his wheelchair and move around since nursing home bed sores or pressure sores can develop from sitting in one position for too long. He got along for the next few years, still seeing visitors and answering mail. Ultimately, Marge could no longer give David the care he required and so he moved, for the last time, to the Valle Verde Health Center in Santa Barbara. On his ninety-eighth birthday, Pat Bergen, her son Brandon, and David's two great-grand nieces visited him. Although tired and frail, he took an immediate shine to the younger child who presented him with a bouquet of sunflowers and a balloon. David Manners died peacefully, at the dinner table, on December 23, 1998. He once mentioned to me that he had been fortunate enough to see Halley's Comet twice in one lifetime. I count myself fortunate to have called him my friend. The last time I saw David was on October 1, 1996, at Marge Mason's home. He joyfully greeted my wife and me and marveled at our nine-month-old baby girl, Mary. Later that month, we moved back east. I spoke with him several times after that but I do wish I could have been with him at the end. 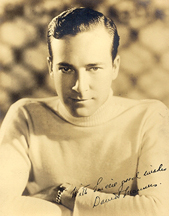 David Manners' ashes were scattered at the location of Rancho Yucca Loma near Victorville, CA.